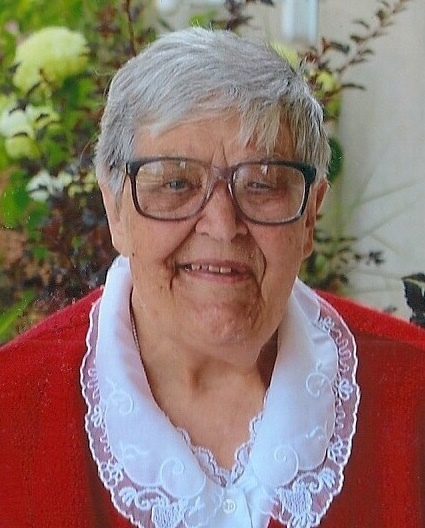 Mary Benco died at home on January 20, 2019, in La Crosse, WI. She was born September 20, 1934, in Cudahy, WI. After graduating from Milwaukee’s Notre Dame High School, Mary proudly worked for Allen-Bradley Company. She also cared for her mother and helped care for her sister’s young family. She was a strong-willed, creative woman who was proud of her Slovak heritage and Milwaukee upbringing. Although Mary loved to travel to different places, including Chicago, Colorado, California and Cuba, her heart belonged to Milwaukee. Mary loved music, art, theater and socializing. She had an extensive record collection, made beautiful pottery and loved to sing. She had many books of different artists, and she would have sketch books, pencils, charcoal, and clay for her nephew and nieces to use when they spent time with her on weekends at her apartment. She took great delight in exposing them to music, museums, and theater. Mary was vivacious, mischievous, and willing to test boundaries and conventions. She was independent, self-reliant and determined to tackle whatever obstacles life dealt her. She was an avid reader and loved to solve puzzles of all kinds. She liked to eat the burnt kernels in a batch of home-made popcorn, and she was a proud Avon Lady. She thrived in the middle of social scenes and was always in the know about politics and the world around her. If you wanted to know what was going on, Mary was your connection, and she was never shy about speaking up and out. She delighted in telling and passing along stories, often with an impish twinkle in her eye. Mary’s proudest accomplishment was raising her son, Michael. Michael was a precocious little boy, but Mary kept him challenged and raised him well. She was especially proud when he graduated from Thomas More High School and went on to graduate from Massachusetts Institute of Technology with a degree in mechanical engineering. Despite geographical distance, they always stayed very connected. Everywhere she lived, Mary made friends and had fun. Her last few years, she lived in La Crosse, WI, to be near Michael. Although she missed Milwaukee and “the Lake,” she was very happy nestled between the bluffs of La Crosse and the banks of the Mississippi River near her son. She is survived by her son, Michael (Andrea) Benco; her sister Anne (Eugene) Holubowicz’s children: Kathy (Joe) Merkel, Jeannie Dretzka and Jeff (Jo) Holubowicz; her brother Joe Pilko’s children: Virginia (Paul) Ramstack and Joanne Pilko; and many grandnieces and grandnephews. She is preceded in death by her sister Anne Holubowicz, her brother Joe Pilko and his wife Lorraine, and Anne’s daughter Susan Helf. I was saddened today when I visited my relative at Hillview and learned that Mary had passed away. How I enjoyed visiting with her when I would see Edna, so much so that even when they were no longer roommates, I continued to see her as well. I thought to myself that even if Edna would go first, I would still stop from time to time to see Mary. I loved her sense of humor and her pride in her hometown and family, especially her son and daughter-in-law. She shared stories with me, of her life and family, and on one occasion, I think I visited with her longer than I did with Edna! She liked seeing my grandchildren and I wish I would have been able to take them one more time for a visit. I will miss seeing this special lady. I wish I would have met her sooner, but am glad that I was able to share in her last three years. May our Lord and Savior comfort you and the rest of her family and friends. Thank you so much for sharing your kind words and for visiting Mom. She would always tell us that Edna’s (or sometimes…Erma’s) favorite visitor had stopped by. Sometimes, we’d even notice first that a new solar-powered figurine had appeared, and Mom would explain that you’d brought it. They were always fun to see. We were so touched that you remembered her birthdays. Mom so enjoyed your visits. Karen, I meant to sign my reply as “Mike and Andrea Benco,” to include my wife. As you can imagine, I’m not quite myself right now. Aunt Mary will always hold a special place in my heart due to her kindness, generosity, and love of life. We miss you Mary! Mom really enjoyed being Elrose’s roommate, partly because of the happiness you brought with you. She still talked about Elrose and each of you. Thank you for being part of Mom’s life. Thank you for your beautifully written obituary. It describes Mary perfectly. She was a fascinating woman, but to me, she was simply “my cool aunt.” I am so grateful that she gave us YOU: her best work of art & intelligence. She will surely be missed, though all that she was, lives on, inside of you! Take solace in knowing that you made her one proud momma! Thanks. And thank you for calling today. It was very nice to talk to you. Wonderful person. I had the pleasure of playing a game called Left Right Center with her and her room mate. She would hardly win but was so happy the she could play. Always helped me to laugh. Always bubbly and liked McDonald’s smoothies. I always told her she did a wonderful job with Mike. He was a great engineer to work with and could explain things down to my level, which was pretty low. As with all wonderful people she will live in the hearts of all she has touched. Thank you Mary for being a part of my life. Mary and I have been friends forever. In fact, I was born in Cudahy in a house behind her house. We were classmates at St. Joseph’s School. Our families were very close as were all the Slovak families in Cudahy. We went to school together, we worshiped together, and had fun together. After high school, we sort of lost contact. I do remember that she and Michael would come to visit my family in Cudahy. She was so proud of Michael. As an aside, I believe that Mary read the dictionary and added a new word to her vocabulary each day. She was very articulate. I wonder what she could have achieved had she had the opportunity to further her education beyond high school. After a few years, I met up with Mary where she lived an apartment building with a mutual friend, Sister Lourdette. Sister and I went to visit her when she moved to another senior housing. We tried to get in contact with her at a later date but she had moved. I felt that she had probably moved to be closer to her son. Mary did not have an easy life but she was always very cheerful. Thank God that He sent her Michael. Rest in peace dear friend. A donation to the Slovak Historical Society will be made in her memory. Mom used to mention you (fondly) when she reminisced about her childhood. The donation is perfect! After Mom moved to La Crosse, we had the Slovak Historical Society newsletter delivered to our house, and I would take it to her. She always enjoyed reading it. Thank you. I started volunteering at Hillview Nursing Home the beginning of this year. I am a senior in high school with a love for helping others. I met Mary back in October one day when I came into her room to just introduce myself. I remember Mary being so polite and welcoming that I came back the next time I was at Hillview and ended up staying in her room for hours. She talked to me about her past in Cudahy and what her life was like growing up. Throughout the next couple of months, I visited Mary all the time and we would talk for hours until I had to go home. Her personality lighted up a room and she made me laugh all the time. Near the end of October I brought her flowers and she couldn’t have been more thankful. When I learned of her passing a few days ago, I took it very hard, but I know she is in a better place now. I will always remember Mary. It is impossible to forget such a wonderful lady. It was so kind of you to visit my Mom! We couldn’t visit with her as much as we wanted to, and it is very comforting to know she had other people with whom to share. I grew up living in Cudahy and hearing those stories, so I had no idea they’d be interesting to others. Thank you.